My research focus is on the device improvements and development of applications of eye gaze trackers in human computer interaction. Eye trackers are devices that inform the position observed by the user at each moment. The most common techniques use video cameras to acquire gaze information (video-oculography). More recently head-mounted eye trackers have been developed to allow for more mobility. 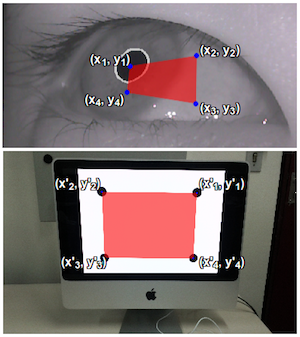 For my PhD, supervised by Prof. Carlos Hitoshi Morimoto and financed by FAPESP, I am looking for solutions to some problems related to head mounted eye trackers, such as the parallax effect, the need for active user participation during the calibration process and variation in lighting conditions. I am currently a visiting PhD student at Boston University under the supervision of Prof. Margrit Betke. Here I am developing applications of gaze trackers to facilitate the computer interaction of persons with severe motion impairments.